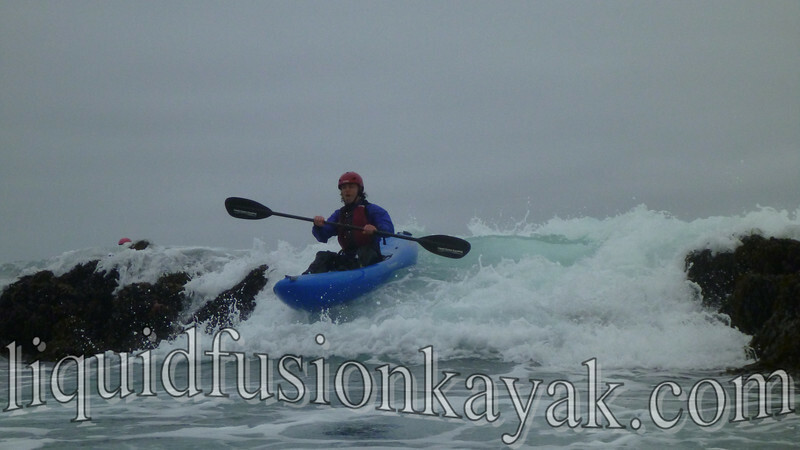 We love kayaking and playing in the rock gardens of the Mendocino Coast in our whitewater kayaks. As Liquid Fusion Kayaking evolved to teaching paddlers of all skill levels, we tossed around the idea of introducing novice paddlers to rock gardening. Jeff boof's a pour-over in the ocean. 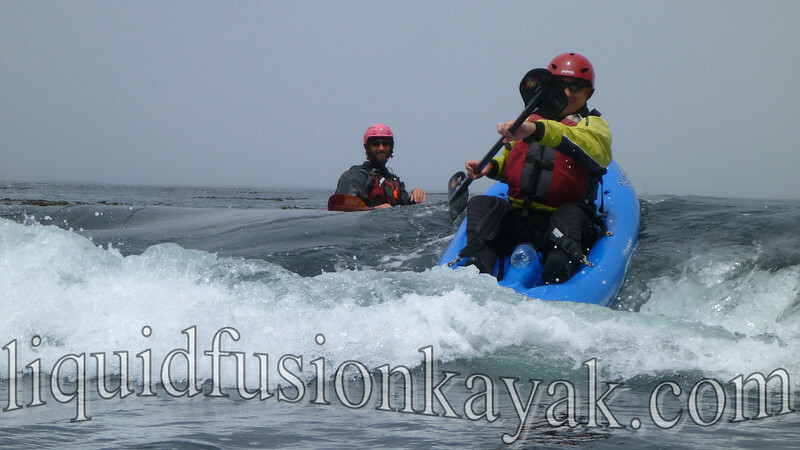 Our vision was to be able to share the fun of kayaking in ocean rock gardens with those who wanted an adventure in the rock gardens and sea caves of the Mendocino Coast regardless of their kayaking skills and experience. We wanted to create a trip that could get our students riding pour-overs and playing in the whitewater features of the ocean in a 3 hour trip. Cate styling it in the rock gardens of the Mendocino Coast. We experimented with some friends to see if this would be feasible (it is great having friends that love to play and are always up for an adventure). 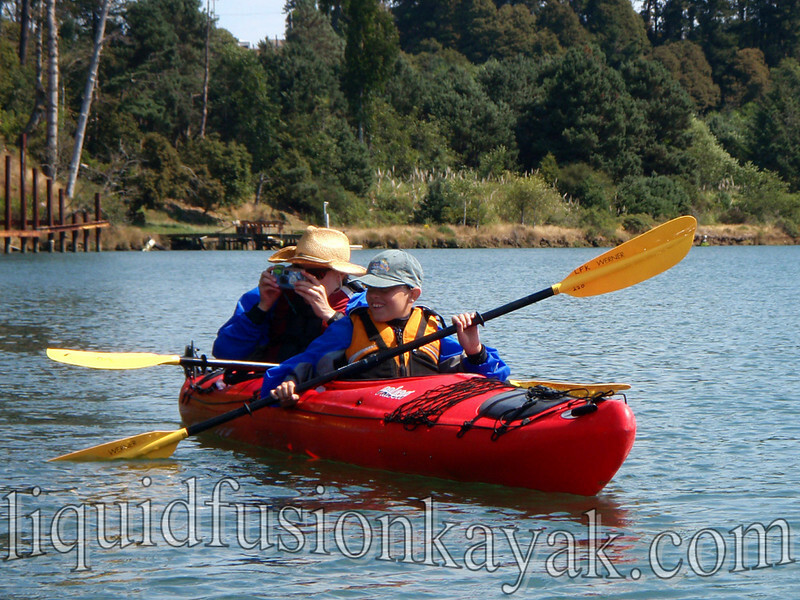 While we liked the comfort and performance of our "old school" decked whitewater kayaks, we recognized that our athletic and water savvy non-paddling pals needed a kayak that was more user-friendly. 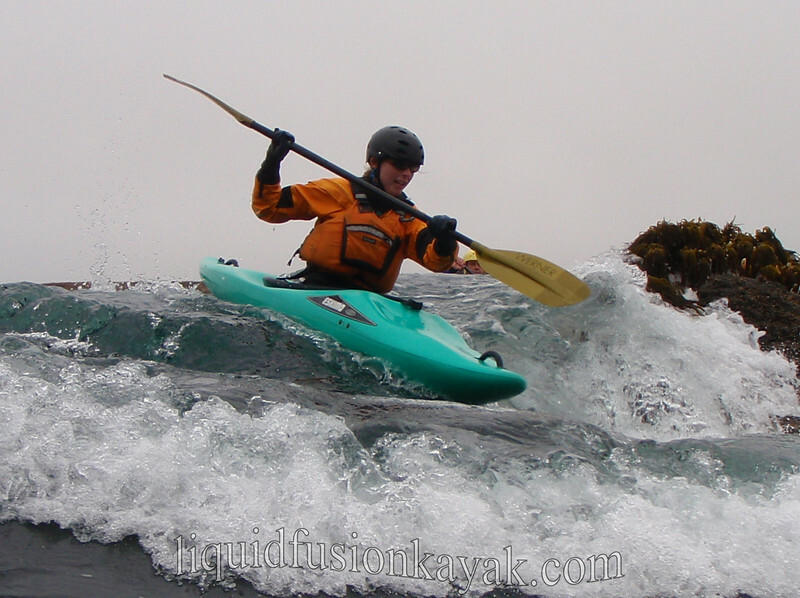 Inspired by the "wash deck" kayaks of the Tsunami Rangers and our own love of the maneuverability of whitewater kayaks, we decided upon the Dagger Torrent - a sit on top whitewater kayak formerly called a Perception Torrent. BINGO!!! We had a winner!!! Stable, maneuverable, easy to adjust and fitting a wide range of sizes, the Dagger Torrent gave us a user friendly craft to for introducing students to rock gardens. 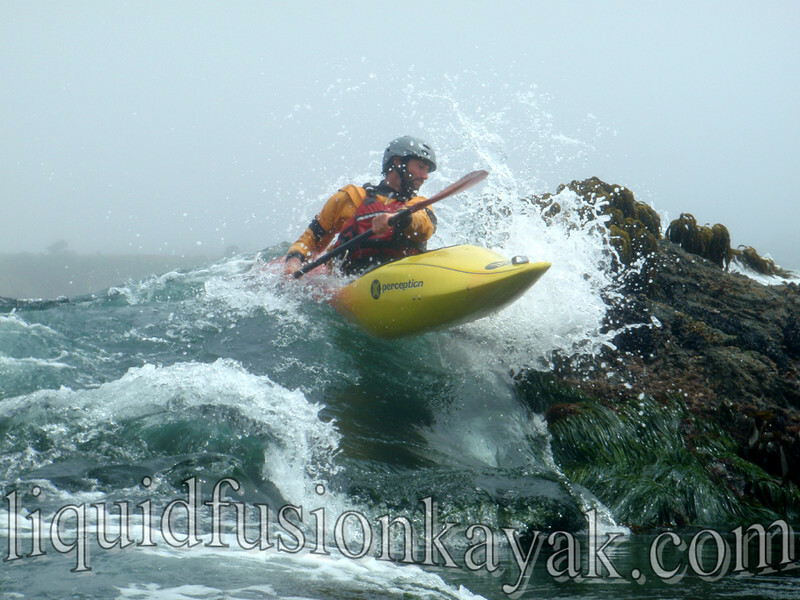 In 2009, Liquid Fusion Kayaking started offering ocean rock gardening adventures for paddlers of all skill levels. 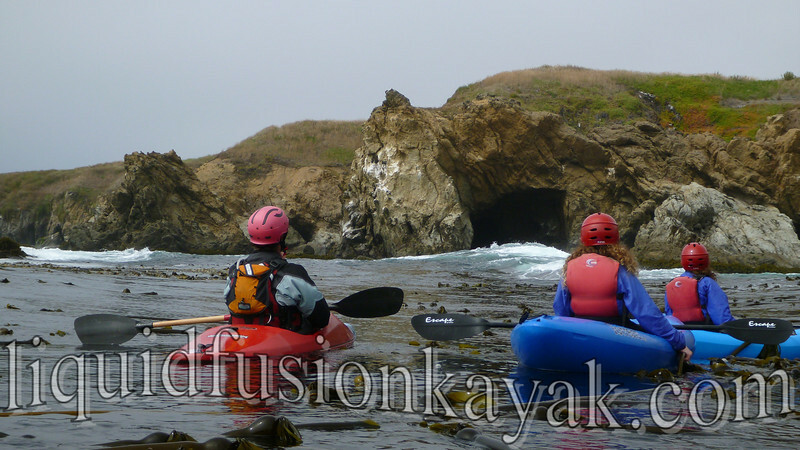 We called it "Mendocino Kayaking ROCKS!!!" 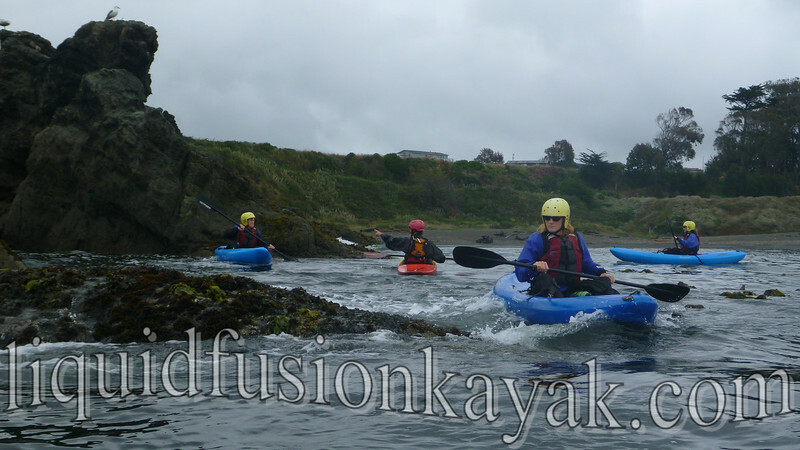 We coined it as our "Wet and Wild Adventure" to contrast with our "Dry and Mild" kayak tours. In 2010, we continued the theme of Wet and Wild but changed the name to Whitewater of the Sea to convey that this is an ADVENTURE in the ocean - kayaking and playing in the waves and whitewater of the sea. Participants usually swim at least once in the trip - unintentionally or intentionally. 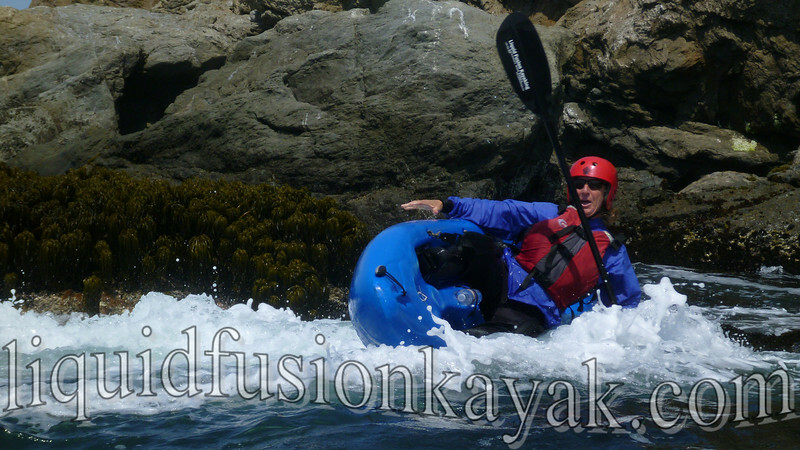 We are in our 5th year of running Whitewater of the Sea Adventures. This year, we have evolved the trip to involve more swimming. Last week we had a blast swimming through a sea cave. The first hour of the adventure is "training" which includes instruction in maneuvering and safety skills. 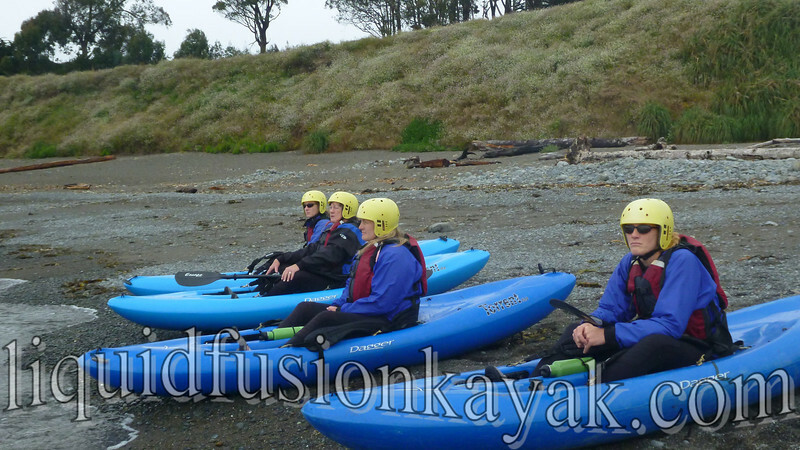 Participants quickly recognize that this isn't your average kayak tour but a fun learning adventure. One of our students wrote about it on YELP - "One of the best classes that I have taken on any subject ever." Students leave the adventure with a better understanding of the ocean as an ecosystem and as a playground as well as tales of thrills and spills. Each tour is different as we cater to each group (usually 4 or less participants) and the conditions. Wildlife moments are enjoyed as they happen from checking out gull chicks to marine mammal encounters. Humpback and gray whales have made appearances during our tours this summer as well as harbor seals, sea lions, and river otters. 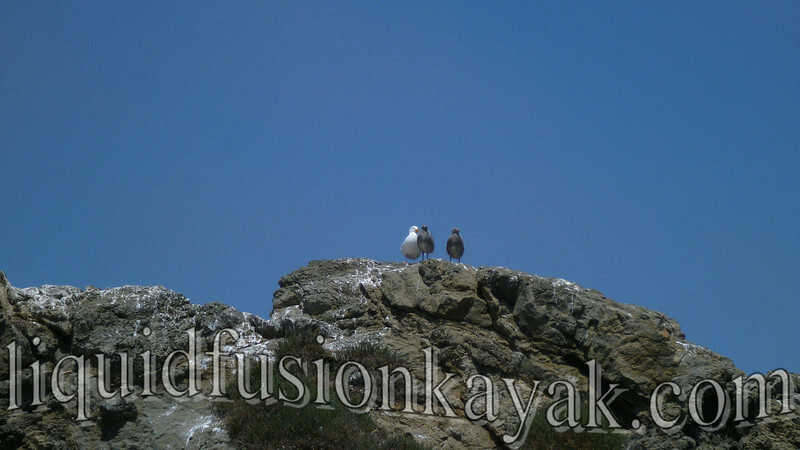 This week, we watched a Peregrine Falcon stooping (diving) some Western Gulls. Western Gull Chicks Checking us Out! 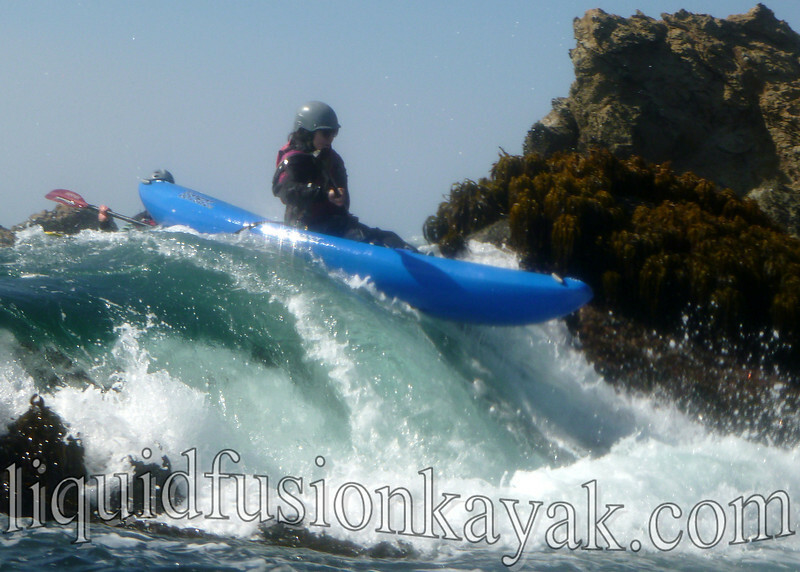 Whitewater of the Sea is an adventure and is not intended to be a substitute for kayak instruction and training. Novice and experienced paddlers on LFK's Whitewater of the Sea Adventure recognize the quality of instruction that is occurring. Jeff has masterfully taken the key skills for rock garden safety and fun and condensed them into a 3 hour course that allows students to be guided in dynamic ocean waters, to run pour-overs, and to play in the whitewater. His teaching progression builds individual and group skills. Of course, the more skilled and able the group - the more that the group gets to do. A special dynamic of rock gardening with a masterful leader allows skilled boaters to share a rock gardening experience with a novice paddling friend. It is possible to have Class II and IV on the same feature and the ability for the guide to choose the challenge level for you. 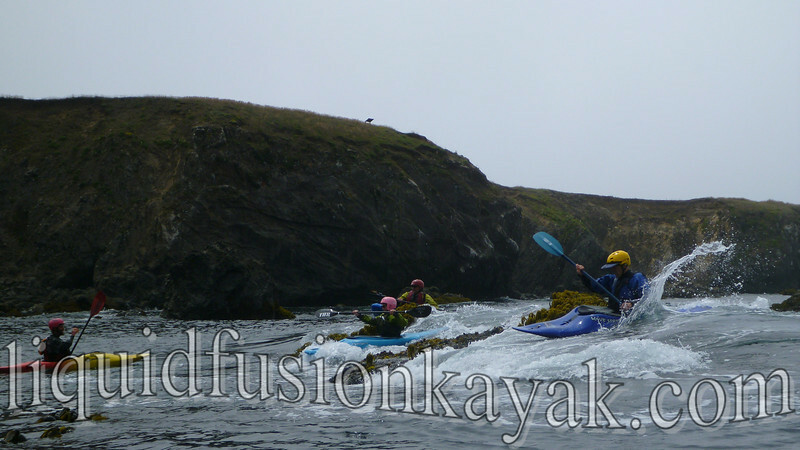 We have had paddlers repeat our Whitewater of the Sea Adventure to learn and experience more as well as bring friends along to introduce them to the fun of paddling and playing in ocean rock gardens. 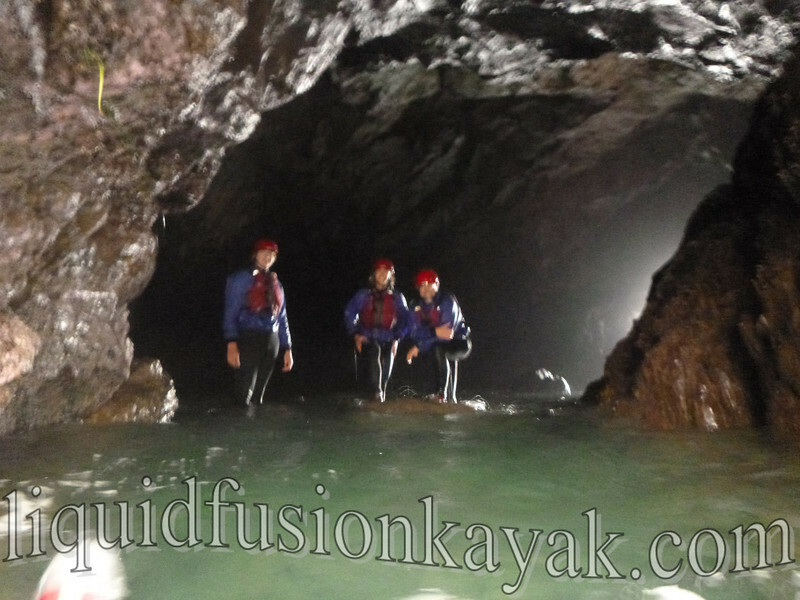 For those that really want more - our Waves n Caves Weekends are 3 days of Whitewater of the Sea. 3 Days of Whitewater Ocean Rock Gardening!!! Of course the bottom line is that our Whitewater of the Sea Adventure is a reflection of our love for the ocean - our passion for playing in her waves and whitewater, our admiration and appreciation of the wildlife that call her home, and the privilege of getting to share it with others. Are you adventuresome? Willing to Play Hard and Get WET? Then here's your official invitation to come play with us in our playground.